What if your deer repellent attracts deer? 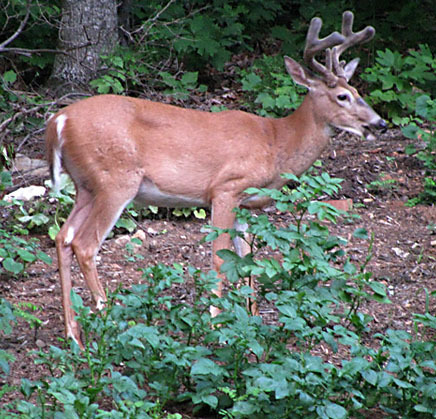 We have been warned that we should take steps to prevent deer from eating our vegetables. So, I make up this really potent hot pepper spray in the blender, put it in a spray bottle and carefully apply to all our vegetables and flowers that the deer are starting to feast on. and then….two hours later, who should appear…. This buck was about twenty feet from the house and was eating the spiced vegetables with great relish. I think we need a different recipe. This entry was posted in Country Living and tagged Deer, deer repellent, pepper spray, vegetables. Bookmark the permalink. 0 Responses to What if your deer repellent attracts deer? It works pretty well on Central Texas Deer. We have been using Nite Guards with success. Try adding some Listerine to the spray. The smell may keep them off the plants. We always used Irish Spring soap shavings around the perimeter of our gardens, orchards, and flower beds. They also work to keep mice out of places. Hope it helps you too. Well for trees, we’d string a whole bar up using a mesh (produce) bag. One full bar would last a couple months. For perimeter fencing we’d nail a whole bar to every other fence post (every 20 ft or so) As it rains the soap melts onto the post. The scent will last all year. I think we initially ran a bar over every post, for quicker distribution. I remember trying lots of ways to make shavings (a knife, a grater, a hammer, putting it between two boards and driving over it.) It’s up to you. This was 20 years ago, I imagine that a blender would do the trick. The bigger the shavings the longer the application will last. Good luck. Depending on whether or not your deer are “humanized”, hair clippings in a stocking or pantyhose works. Around here in KY, deer are hunted and very wary of human scent. I usually shave my son’s head as well as mine at the beginning of the summer and put the clippings in pantyhose around the garden. It’s worked for our garden.